The 2018 College Football Playoffs (CFB Playoffs) are finally set after a wild finish to the regular season. Coming into the conference championship weekend, all but one of the potentially-eligible seven would be playing and one game featuring a matchup of two teams from that list. There was everything to lose and everything to gain. (1) Alabama faced off with (4) Georgia in the SEC Championship Game. Many experts believed that if Georgia upset Alabama, the top four teams would all remain the same but the seeding would change. However, Alabama pulled off the miraculous comeback in the same fashion as the 2017 national championship game. The winner of Alabama-Oklahoma will face the winner of Clemson-Notre Dame for the 2018 college football national championship! But did the College Football Playoff Committee get it right this time? Alabama is the undefeated best team from the best division of the best conference. They are the only team since 1888 Yale (yes, that 1888) to defeat all of their opponents by at least 20 points in the regular season. The Crimson Tide dynasty was built by a swarming, smothering, all-world defense, but this isn’t yesterday’s Alabama. The 2018 Alabama Crimson Tide are among the best offenses in the league led by their Heisman hopeful QB. There is no doubt the defending national champions deserve to remain ranked #1. Clemson has been the favorite challenger to the Alabama crown recently and has even taken it from the evil empire the last time they faced off in the championship game. Clemson’s road to the playoffs was not the toughest but it left no doubt dominating its schedule. Will the change to freshman QB sensation Trevor Lawrence be enough to win the national title? By far the experts and public’s least favorite playoff team. Notre Dame’s schedule has been pretty easy on its path to the playoffs. The biggest challenge came against now #7 Michigan in the opening game of the season. Like the last time Notre Dame made the championship game in 2012, it just doesn’t feel right. Notre Dame is the underdog of the group for sure. Critics say that because Notre Dame does not play in a conference championship game and its schedule is weak, the Fighting Irish shouldn’t be considered for the playoffs. Since when has this mattered? Alabama has won two national championships in the last decade without even winning its own division! Oklahoma is the #1 offense in the country led by a future MLB outfielder and Heisman finalist QB Kyler Murray. Oklahoma also has the worst defense in the group and it’s not even close. Can the Sooners offense out gun the opposition on the way to a national championship? Last year’s semi-final game against Georgia was an instant classic. Oklahoma is the only team that is not undefeated in the playoff. However, the Sooners avenged the 3-point regular season loss to rival Texas by beating the #12 Longhorns by 12 in the Big XII Championship Game (that is a lot of 12’s). Georgia fans and many college football experts believe that the Bulldogs deserve to be in the playoffs. For the second straight meeting, Georgia carried a multi-touchdown lead into the 4th quarter against #1 Alabama only to lose to a backup QB late in the game. Georgia had its chance. The SEC Championship Game was a play-in game for the Bulldogs. Georgia lost. It’s over. A two-loss team cannot be in the playoffs with so many other deserving undefeated and one-less teams being left out. Georgia was also beaten badly by LSU in the regular season, 16-36. A 20-point loss is why Georgia is out of the playoffs, not the close loss to Alabama in Atlanta, no matter how close. This also would not be fair to Alabama. The #1 seed is supposed to be the easiest path in any bracket style tournament. The Georgia Bulldogs seem to have a recipe to almost beat Alabama. Alabama has now elminated them twice. There is no reason to play this game a third time. There’s always next year Georgia. Perhaps the most confusing team on the list, the Ohio State Buckeyes have been the least consistent team. After starting the opening month of the season scoring over 50 points per game and allowing less than 20 points per game, the Buckeyes hit a slump. The Buckeyes were very fortunate to comeback and beat #12 Penn State, 27-26. Just a few weeks later, unranked Purdue destroyed the Buckeyes, 20-49. This game basically eliminated Ohio State immediately. How can a championship team lose to an unranked team by four touchdowns?! The very next week, the Buckeyes nearly loss to another unranked opponent in Nebraska, 36-31. Then two weeks later, the Buckeyes should’ve lost to another unranked team, Maryland. Ohio State barely pulled out the victory in OT, winning 52-51. To finish off the regular season, a struggling Ohio State hosted arch-rival and highly-ranked Michigan. Michigan was poised to make the playoffs with its only loss coming in the opening week to #3 Notre Dame in a close game. Ohio State destroys Michigan, 62-39. What do you do with the Buckeyes? Ohio State should’ve finished the regular season with three or four losses instead of just one. The most disappointed and devastated team has to be Michigan. The fanbase is starving for a playoff run. Everything looked set to finally advance into the playoffs. Michigan had run the table since losing in Week 1 to #3 Notre Dame. Ohio State was struggling allowing over 50 points to unranked and head-coach-less Maryland just the week before! Somehow, Michigan gets blown out by its rival and in the process eliminated once again from the College Football Playoffs. This was a “win and you’re in” game just like Georgia faced. It doesn’t matter the point difference. Nobody is making a case for Michigan to get into the playoffs. Why is it any different? 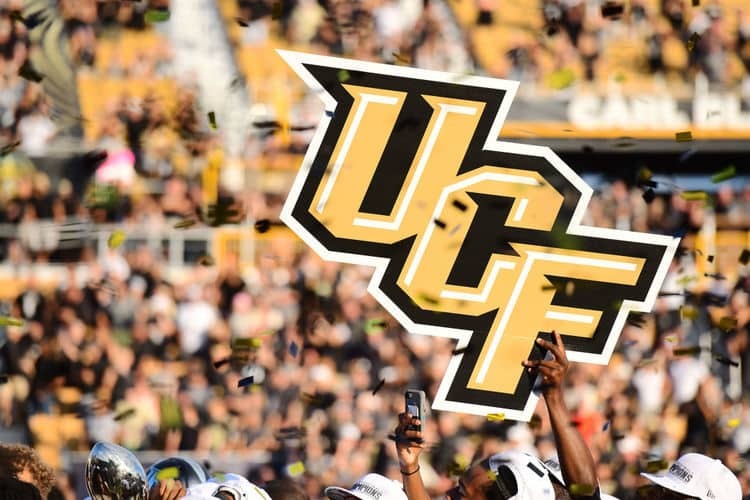 UCF was left out of the College Football Playoffs in 2017 despite going undefeated in the regular season and winning its conference championship game. After defeating Auburn–the only team to beat the two national championship finalists in 2017–UCF announced a self-proclaimed National Championship. Well, the UCF Golden Knights have done it again. Even after losing Heisman dark-horse candidate QB Milton in the final week of the regular season, the Golden Knights were able to led two impressive come-from-behind victories to win yet another conference championship. The only reason UCF is not playing for a national title simply because they are UCF. As a Group of Five team, the College Football Playoff Committee shows no respect for the “little guy.” UCF is now 27-0 in the last two seasons yet isn’t any higher than 8th in the rankings. This is a tragedy to college football. The UCF example shows a major flaw in college football. Either the College Football Playoff needs to expand to an eight-team playoff or there needs to be another division of major college football created. If the 27-0 Golden Knights are not qualified for the playoff, no Group of Five team will ever be. Let’s compare the schedules of #8 UCF and #3 Notre Dame. UCF only had one scare on the season to Memphis (who was ranked at one point during the season) winning 31-30. UCF played Memphis again in the conference championship game, this time without its star QB, and won 56-41. The next closest margin of victory was against Navy were the Golden Knights won 35-24. Meanwhile, Notre Dame beat #7 Michigan by a touchdown on opening weekend. Outside of that one game, Notre Dame’s only other ranked opponents are #20 Syracuse (winning 36-3) and #22 Northwestern (winning 31-21). The Fighting Irish also faced a scare from unranked Pittsburgh, edging out the Panthers late, 19-14, and unranked rival USC, 24-17. Notre Dame and UCF shared a common opponent in Navy. Notre Dame won by 22. UCF won by 11. Notre Dame is ranked 7th in ESPN’s College Football Power Index compared to UCF who is ranked 23rd. Part of this ranking is decreased due to the UCF-UNC game being cancelled because of a hurricane. Critics say that UCF schedule is too weak. UCF can only play who is on its schedule. Power Five teams do not want to play UCF. The Golden Knights have the ability to beat most Power Five teams and would be favored in a lot of games. It does not benefit to any Power Five team to play them. If you win, it’s a win over a Group of Five school. If you lose, you may very well cost yourself any chance at making the playoffs. All FBS teams across the country do not have a chance at the national championship. Believing anything else is just buying into a lie. The University of Central Florida should be recognized for back-to-back undefeated championship seasons.